It may be premature to assume that China’s growth will continue at its recent pace. Here are some thoughts on the topic. 1. The over-50 Manufacturing PMI number that everyone got excited about may be an aberration. 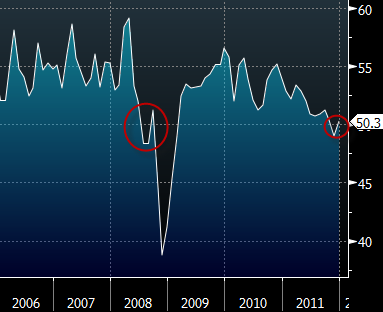 Also a similar blip took place back on 2008 before the real slowdown. Michael McDonough (Bloomberg Economist, Hong Kong): China's better than expected PMI is likely to be an anomaly, thanks to early Chinese new year. Forward looking components still below 50. 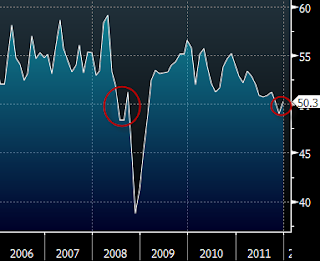 An example of a forward looking component is the employment PMI (see chart). 2. Property correction is still in play. 3. Social unrest remains a risk. 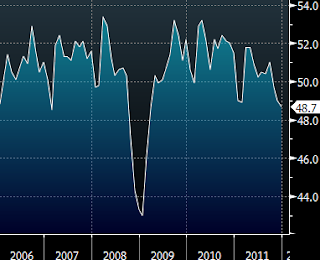 ISI: Real GDP slowing to 7.2%. We are below consensus. Soft landing. More monetary easing. Clearly we are not coming off the cliff, but it’s too early to assume it’s easy sailing for China.